Earlier this week, with tax time approaching, I went to a former employer’s website to download a tax form for the pension I receive. Since I only go to their site once a year, I wasn’t surprised that my password needed to be reset. I was surprised how picky they were about resetting. Fifty-plus words in the guidelines, and I still failed the first attempt — probably because the new password my password-manager software generated was too long. I cranked down 1Password‘s default of 20 characters, then failed again from not noticing the begin-and-end-with-a-letter part. Finally, I managed to enter a password GE could live with. On the same screen , I saw they wanted contact information. Here too they provided highly specific guidance that managed not to guide that well. What is with those min/max phone number fields? Diminished as it is, GE’s a global company, with roughly 100,000 employees in the US, and more than 260,000 American retirees. Bump those up by, say, 10% to include Canadians, and you’ve got 400,000 people whose phone numbers, mobile or land line, fit the North American pattern of 987-654-3210. And if I have to enter a minimum of 3 and a maximum of 3, you could just say “3 digits.” Why I have the option for zero digits in the second field passes my understanding. You won’t be surprised to learn I wasn’t able to automatically go to the second field after entering three digits in the first. Nor was I able to tab–I had to click. The phone business was a detour on my update journey, as it is here. I’d meant to update my email. That’s where GE shifted from guidelines to just plain nitpicking. As soon as I started typing in the “confirm” box, the red finger-wagging appears to make sure I knew the two versions of my email address didn’t (yet) match. I didn’t include it in the screen shot, but the Send button, which probably had a much more technoid label than “Send,” remains inactive until the two versions of the email match — so it’s not possible to submit ones that aren’t a match. I think it’s great to have some confirmation that a process has begun. It’s not nearly as great when there’s no clear message to say the process had ended. Granted, the first sentence below the heading says the password “will be reset immediately.” But I came to this sequence after entering my old password, which is a good suggestion that I had something I wanted to do, and it probably wasn’t resetting the password. In other words, the Identity Manager interrupted me, dragged me into this administrative chore, and has left me here wondering how to get my tax form. There’s nowhere on this screen I could click to get me there; I’m stranded on Identity Island. I have to close the browser and start over. Luckily for me, 1Password worked the way I expected, filling in the new password. I made my way to the tax information screen and clicked on the helpful link to view or print my 1099 form. Good thing I knew that 1099 was the form I wanted. Passing by “maintainance” as alternative spelling for maintenance, take a look at the time window… and the time. I’m in the Pacific time zone, so for me the maintenance window would have been 2:00 – 6:00 pm. I saw this message at 6:59 am. Maybe the maintenance took longer than expected. Or started sooner. This might seem like a lot of grousing about relatively minor setbacks. The unfortunate part is that the experience suggests a stronger focus on the system and its requirements — or preferences — than on employees or retirees and their wishes. I’ll bet GE has a good idea how many times a year people need to reset their passwords. A little data collection might even reveal patterns about what people did after resetting, emphasizing that resetting is probably not a primary task for people using this site. Making practical use of that information isn’t flashy, like responsive web design or roller-towel pages, but it’s a solid move toward user support, especially in this kind of I-don’t-come-here-often setting. In my Building Job Aids workshop (presented last Tuesday at DevLearn 2015), participants analyze multiple case studies, applying techniques and using job aids to, well, build job aids. Among the skills they practice are the ability to choose the right type of job aid for a task, and the ability to use that type effectively. There’s a lot of thinking and writing: I make an effort to avoid explaining much before an exercise. Instead, there’s a minimal introduction, with a lot of what would have been explained turned into a print resource to be consulted as needed. One potential downside is that especially an hour or so after lunch, thinking and writing are conducive to dozing off. At the same time, my assumption was that participants would want and need additional practice on relevant examples. How could I give someone the chance to assess different job aids and rate their effectiveness? Did she think the samples would produce the desired result? How did they align with ideas in our workshop? I liked this title so much, I was determined to use it. But I’ve learned not to be literal about this kind of borrowing. What makes Jeopardy!-style games in training a dumb idea (even a counterproductive one) so often is not (necessarily) Jeopardy! itself. It’s the mismatch between the content and a format best suited to recalling isolated facts. 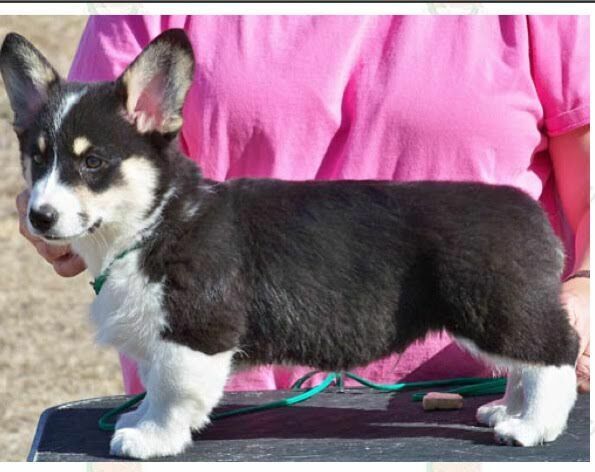 Some characteristics of dog shows that I thought suited my goals: I had widely different types of job aids, like the different dog breeds. I had limited time, which at least for me was like the dog-judging segment where the trainer fast-walks the dog in a set pattern before the judge. Plus judging. That’s where I had the most trouble. How to get multiple points, an overall total per judge, and a logistically sane process? I started with a three item scale, rating each job aid on its fit (is this a good job aid for this kind of task? ), its function (is it likely to produce the desired result? 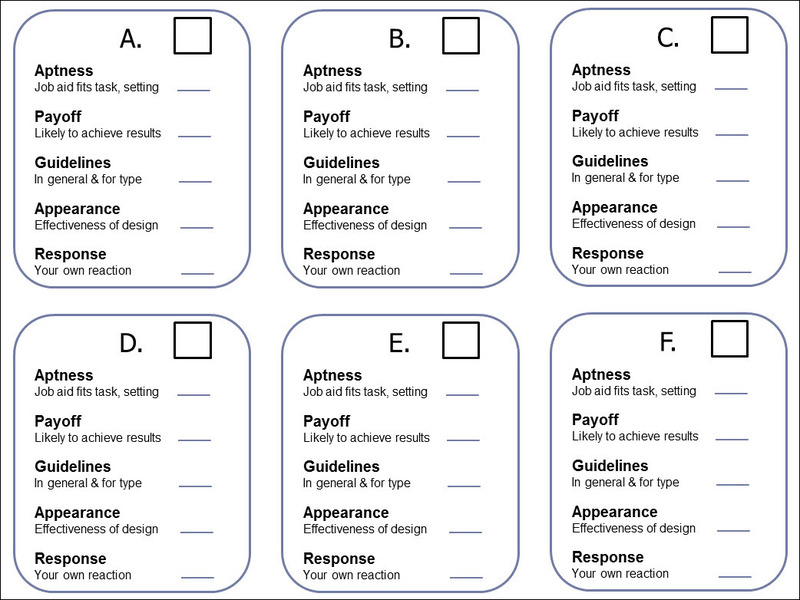 ), and its format (how does it stack up against the job aid guidelines in the workshop). I could score each of those from 1 to 3, with an extra point thrown in for personal preference. No matter how I squinted, though, it looked like way too much math. Then I remembered the Apgar score – a quick assessment of a baby at birth. Five qualities like heart rate or respiration are each assigned a score of 0, 1, or 2. The total describes the baby’s physical condition on a scale of 0 – 10. Response: the judge’s own reaction to the job aid. As you can see, each item had a line for its score, with a box on top for the total. I was pretty sure I’d have a decent internet connection. I made a slide with links to my six examples. I explained the scoring, distributed the ballots, and showed each competitor for 30 – 60 seconds, with some contextual commentary as needed. If I’d had a large group, my plan was for each person to fold the completed ballot between the six boxes, so as to tear it into six individual sheets. I’d have had one person total the ballots for competitor A, one for B, and so on. My workshop group was small enough that I could divide a sheet of flipchart paper in six as Voting Headquarters. It was little trouble for me write down scores by candidate and then total them. Best in Show was a success, both as a change of pace and as an exercise in judging job aids. It also broadened exposure: half the competitors were new; the other half had been seen only briefly, as examples, earlier in the day. An unexpected plus: everyone could see all the individual totals. One job aid received solid 10s except from one person who rated it a 7. Another participant said to her, “I want to know why you rated it a 7.” The question was not a challenge but rather genuine interest in how another person applied the principles of the workshop. I’m really pleased this went as well as it did. I’m thinking of ways to make it work better (one participant was confused by my instructions and rated on a scale of 1 to 3 rather than zero to 2). And if I have more time, I’ll have a follow-on exercise: Raise the Runt. The idea would be to see which job aid scored the lowest, and then talk about why and about how to improve it. Lots of people in my extended network have been working out loud — sharing what they do, and the thought process behind it — long before #WOL as a term got very far down the street. This informal reflection (often followed by informal exchange) has made a tremendous difference in how I learn things and how I get better at things. If you’re not familiar with the idea, for starters there’s John Stepper’s book, and there’s Jane Bozarth’s Show Your Work. In both cases the emphasis is not simply on what gets done, but how it gets done. If you’ve got some future goal — say, you’re giving a presentation in four months — there’s research to suggest that framing your goal in days, rather than weeks or months, is a much more effective way of spurring yourself on. The notion intrigued me, and with not much searching I found the Countdown Widget at the Google Play store. The day I installed it was four months ahead of the target I’d set for myself. But the widget counts down in days — so it displayed 120 on my phone. 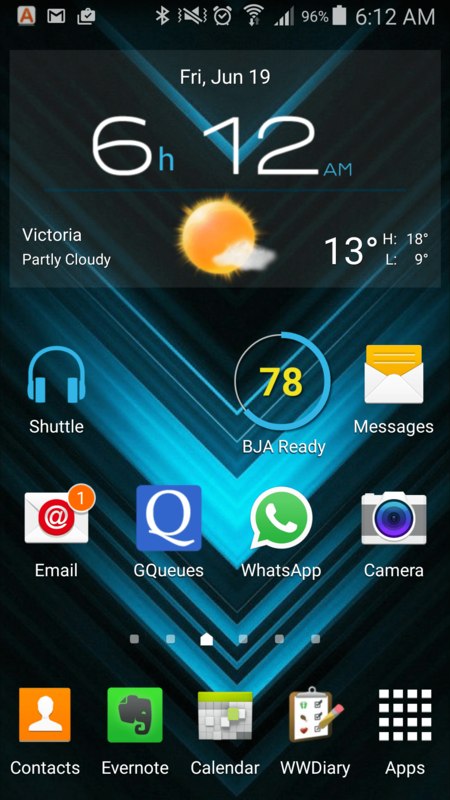 As you can see in the screen shot I took this morning, that’s now down to 78. I’ve got work to do this weekend. I made sure to put the widget on the home page, and so every time I glance at my phone, I’ve got a double reminder of the schedule I chose: the number of days appears, and the bright ring around the number disappears, bit by bit, with each passing day. What this has done for me is probably what end-of-the-day reflection does for other people, or a carefully tended to-do list: I look at this and ask myself what I can do next to move forward toward my goal. Another out-loud angle: I talked about this with a co-worker, and at least three times a week she’ll notice the countdown on my phone and ask what I’ve done on my project lately. 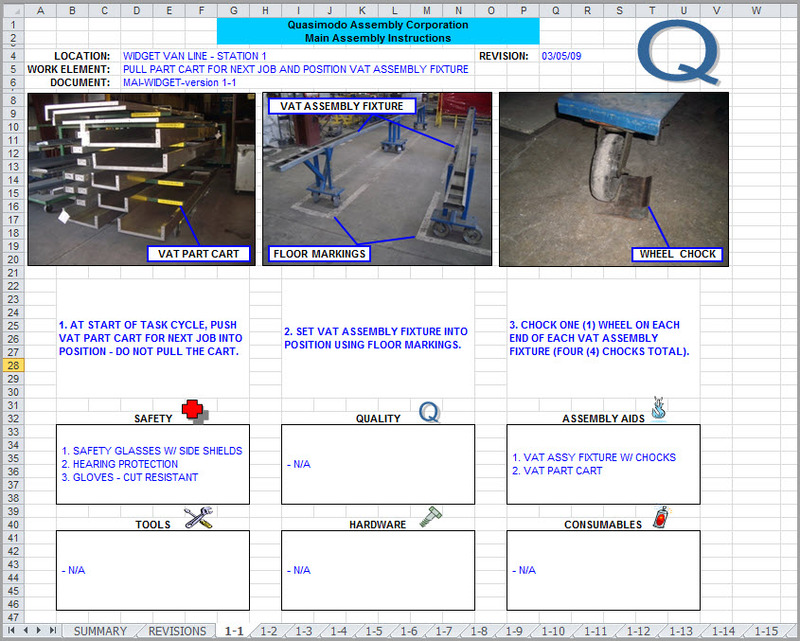 In a previous post, I showed a fictionalized example of an actual guide for assembling a piece of industrial equipment. These instructions weren’t particularly well done, and I set myself the task of making some improvements. I also wanted to explain what I did, and why I thought it was an improvement. We’re guiding a task that’s mainly a procedure: a sequence of steps that follow one another logically, with relatively little decision-making. I see this as a job aid for lots of reasons, including the large number of steps. A number of my revisions are part of what any good job aid should include. The original read “Main Assembly Instructions,” which is ambiguous at best, unless Quasimodo Corporation only assembles one thing. Here I’m pretending that there are several models of widget vats that differ mainly in size. I’ve put the model numbers into the title so the assemblers can tell easily if these are the instructions they want. 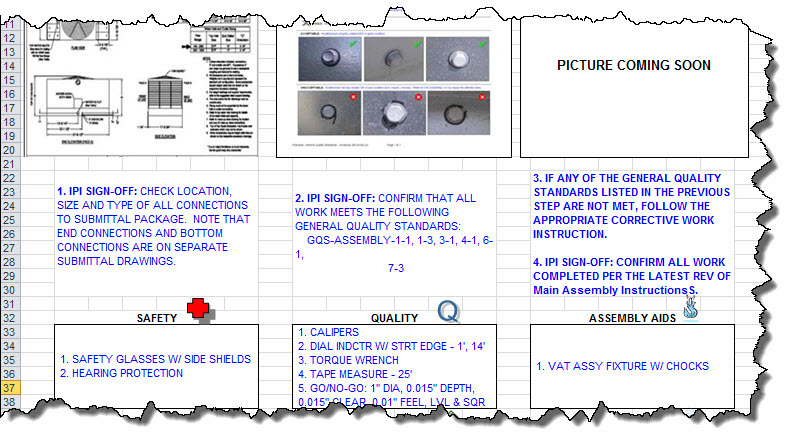 Every page of the original version had a box listing the same three pieces of safety equipment–as if the developer thought the assemblers might take off their safety glasses between pages 11 and 12. I’m also pretending that the “submittal drawing” spells out things like how many fasteners you need of each type. If that were not the case, I’d have to find out from my client whether (for example) the fasteners were stored at the assembly point, and if so how the workers could get more when they needed. The original version didn’t make much effective use of contrast, alignment, or spacing, so it’s much harder to figure out what’s important. That’s one reason I’m a fan of language like “before you begin.” In my revision, that stands on its own as the header for a number of items that we want the worker to do before starting the assembly. And rather than the original’s unfortunate use of ALL CAPS, I recommend using capitals, boldface, or similar techniques in specific, limited circumstances. One of those circumstances is to highlight words like DO NOT, EXCEPT, DANGER, and so on. Although the original used over 50 photos, in my revision I’ve hardly used any. In part that’s because I didn’t have good replacements for the photos–but also because many of the original photos fail to contribute useful guidance. One problem with the original images–and with photos in general–is that they often provide too much detail, making it hard to grasp what’s important in a particular step. Or they ignore context, also making it hard to grasp what’s important. The changes here, and the reasons behind them, apply to most performance guides like this. In my next widget vat post, I’ll show some revisions I’d make that are specific to procedural or step-by-step job aids like these instructions. Last week, I had a Twitter conversation with Jane Bozarth and David Glow. All three of us, I think, started by having fun with the, um, suboptimal material Jane had been given to start with. I briefly described a spectacular example of a wrongheaded job aid, but we moved pretty quickly to the idea that mockery (however well deserved) wasn’t enough. So rather than post this fictionalized version as a candidate for the Worst Job Aid Ever, I thought I’d try doing two things: talk about why this attempt works so poorly, and suggest some things I’d do differently if invited. I’m grateful to David and Jane for encouraging me in this. It’ll be a bit wordy, so I’ll break it into two posts. This is the first. You may have noticed that the assembly instructions were created in Excel. I confess that I’ve kept this unique document for selfish reasons: it’s one of the most bizarre attempts at guiding performance that I’ve ever seen. I’m not here to talk about bizarre–at least not today. I’m here to talk about why these instructors fail so badly. 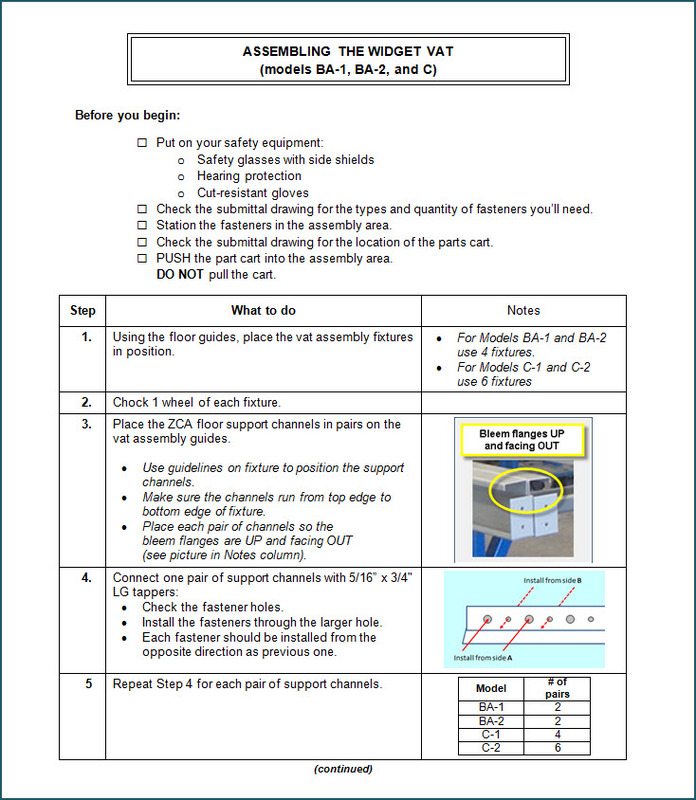 It’s true that never before nor since have I seen an assembly guide written in a spreadsheet, but that’s more a symptom than the underlying problem. A more important question: what’s Quasimodo’s problem? In other words, what are they trying to get done? I’d say their goal is to have assembled widget vats that pass inspection and meet cost guidelines. 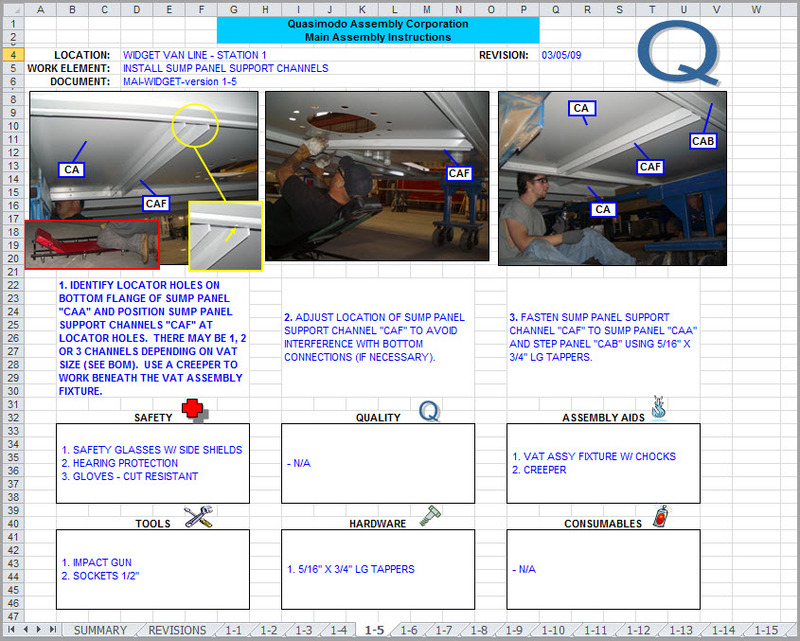 Position center end wall panel CAD on assembly fixture. Use two people or a jib crane to lift panels. Check submittal for end wall connection and bottom connection orientation. Fasten center end wall panel CAD to floor support channel ZCA using 3/8 x 1-1/4 LG screw. I imagine these instructions were printed, pages slipped into sheet protectors and stored in a ring binder at the assembly area. They’re like a recipe from an industrial cookbook. So the fact they were created in Excel, while non-typical, is less relevant than the barriers created by their overall layout and especially by their approach to guiding behavior. What else do we know about assembling the widget vat? Workers need safety equipment like hearing protection and safety glasses. Parts of the task involve specialized equipment (like that jib crane). Some ways of working are more efficient or more effective than others (“start at the center and work your way out to the ends”). 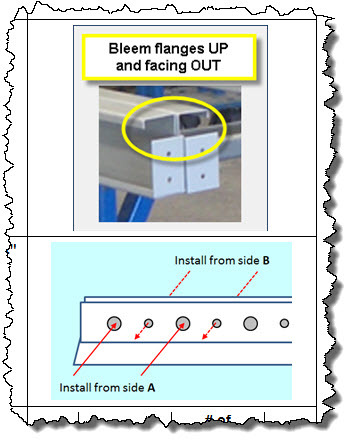 Detail often matters (as in the note above to check the submittal, a kind of specification for one specific assembly job). And why doesn’t this attempt work well? To shoot the biggest fish in the barrel: Excel isn’t a word processor. It’s not a publishing tool (unless you’re publishing numbers and charts, or else tables of data). Creating this guide in a spreadsheet needlessly complicates the task of updating and revising — and even searching. This isn’t even well-done document publication via Excel. Here’s a portion of page 1-5 (the second image above). 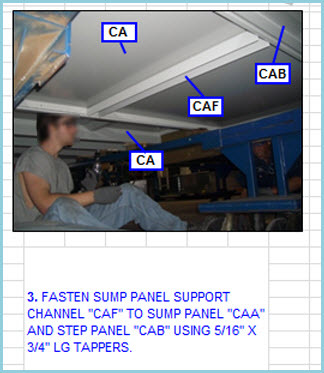 Note that the photo includes two callouts labeled CA while the accompanying text refers to panels CAA, CAB, and CAF. If you had the Excel file, you could enlarge the two CA callouts in the picture, and then you’d see that one of them actually reads CAA while the other reads CAB. So Doctor Spreadsheet may not have been a proofreading whiz. But who cares? The reason Excel is a poor choice is that nothing calls for Excel. There isn’t a single calculation in the entire document. You might as well have produced this in PowerPoint. Or taken photos of alphabet magnets you arranged on your fridge. From a graphics standpoint, the lockstep layout assigns equal weight to two areas (task photos and procedural steps), and the same total weight to six blocks, one of which (quality) reads “n/a” on all but one of the 15 pages. Most of the time, a third of the space on a page is sitting around doing nothing. Nothing except confining the actual performance steps to their all-cap prison. 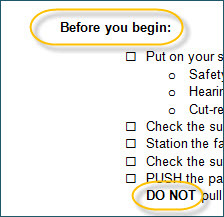 Before you begin information (like equipment and parts to have) should appear before the steps in the procedure. Visuals, when necessary, should appear next to the step they illustrate. Information that’s not needed on a page should not appear and shouldn’t have a reserved parking space that does nothing but delineate whether the information might show up on a subsequent page. The vertical centering manages to complicate reading even more, a remarkable feat for such a small amount of text. Another complication: in this example, step 5 says to repeat steps 1 through 5–a good recipe for an endless loop. I think the assemblers would figure out what the designer meant, but it’s no thanks to the designer. 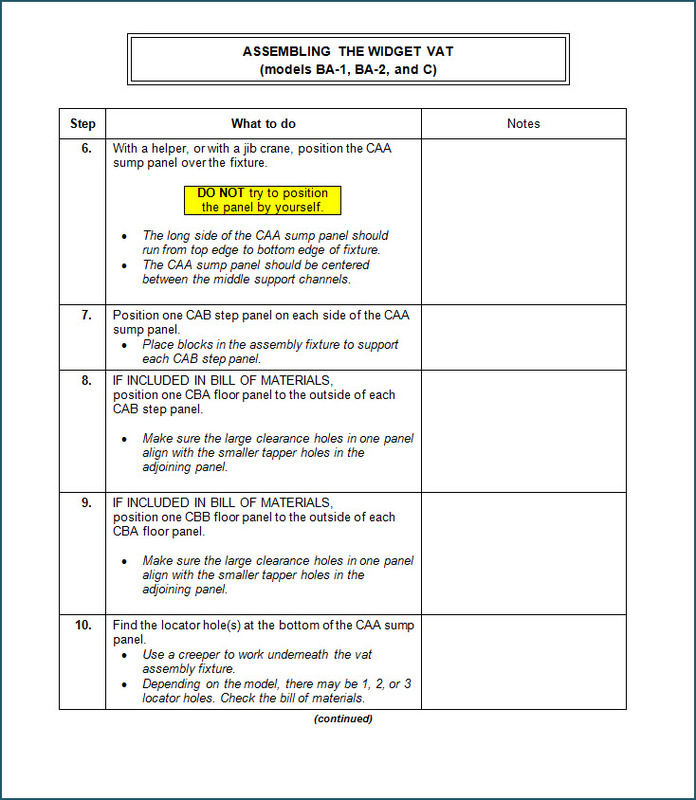 So, as it exists, the QAC assembly instructions are hard to update, hard to read (from a graphics standpoint), and hard to follow (from a getting-your-work-done standpoint). It doesn’t seem like they’d easily get Quasimodo to the goal of assembled widget vats that passed inspection at a cost acceptable to the company — at least not until the workforce managed to build enough of these things to not need the instructions. In my next post, I’ll show some possible revisions and talk about why I think they’d help. But I don’t have to have all the fun: add your comments. Ask your questions–if I’m able to, I’ll answer them. Let’s see if we can get to IPI sign-off a bit faster. You know, so we can excel.